SAVANNAH, GA — The air smells sweeter here. Snow was still piling up in the Inland Northwest in early March. But spring had already sprung in Savannah, where the air was gently scented with Georgia pine, wisteria and jasmine. Daily temperatures averaged 70 degrees, Spanish moss seemed to drip from all the trees, and azaleas were everywhere. Camellias, too. One of the best parts of visiting Savannah in spring is simply walking around admiring the colorful blooms and antebellum architecture. Founded in 1733, Savannah is Georgia’s oldest city. And it’s highly walkable. City blocks aren’t long here. Some just run the length of just one or two mansions. You’ll want to wear flat, comfortable shoes. Streets and sidewalks — made up of brick, granite and slate Belgian blocks, cobblestones, concrete oyster shell aggregate, prismatic glass, flagstones and more — are often uneven. You’ll want to bring bug spray, too. No-see-ums is a cute name for biting gnats. They come out to feed in the early evening in spring and fall. I came home with more than three dozen unexpected souvenirs: bites from my forehead to my ankles. So, for my next visit to the Hostess City of the South, I’ll be more prepared. 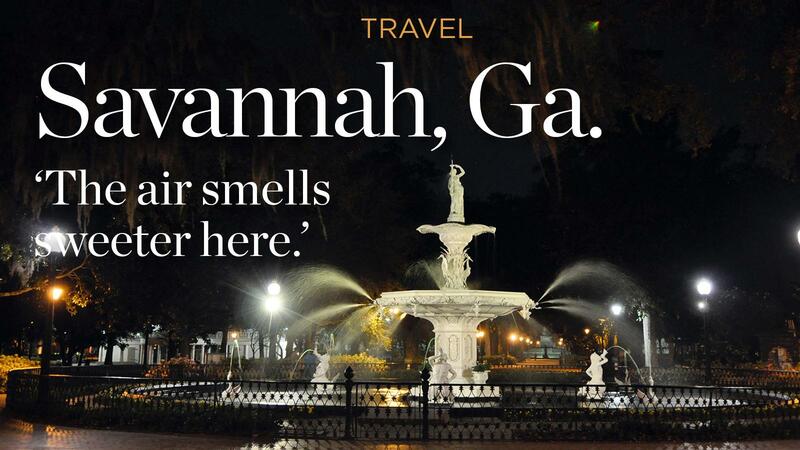 Meantime, here are nine things to do to introduce yourself to old-town Savannah. Stroll from square to square reliving some of Savannah’s most famous movie scenes. Savannah’s famous Historic District, laid out in an easy-to-follow grid pattern, is dotted with two dozen picturesque public squares anchored by enormous oak trees and adorned with azaleas, benches, fountains and monuments. One of the most famous is Chippewa, where Tom Hanks as Forrest Gump waited for the bus. The bench was a movie prop; it can be found in the Savannah History Museum. But the diner where Robin Wright as Jenny worked is real and can be found at the next square to the north, or Wright Square. Bull Street connects both. It’s lined with antique shops, boutiques, restaurants and historic homes, some of which offer tours. Follow Bull Street south to Monterey Square, and you’ll find the mansion featured in “Midnight in the Garden of Good and Evil.” The Mercer House is now a museum, and tours are offered. www.savannah.com/savannah-historic-district. Meet “Bird Girl.” Made famous by the Jack Leigh photo on the book cover of “Midnight in the Garden of Good and Evil,” this 1936 bronze Sylvia Shaw Judson sculpture was moved from its original location at the Trosdal family plot to the Telfair Academy of Arts and Sciences, where it stands at the top of the second-floor staircase. The work features a girl clad in a simple dress balancing two bowls, or birdfeeders, in her outstretched hands. The Trosdal family referred to the sculpture as “Little Wendy,” and it’s just one of many works at the academy located in an 1819 Regency-style mansion. A ticket includes admission to three museums: the academy as well as the Jepson Center and Owens-Thomas House and Slave Quarters. www.telfair.org. Get in touch with your inner Girl Scout. The birthplace of Juliette “Daisy” Gordon Low, the founder of the Girl Scouts, is one of Savannah’s most-visited destinations. Located on the corner of Bull Street and Oglethorpe Avenue, in the heart of the Historic District, this Federal-style mansion was completed in 1821 for James Moore Wayne, a mayor of Savannah and U.S. Supreme Court justice. He sold it to his niece, Sarah, and her husband, William Gordon, Low’s grandparents. She was born here in 1860. The house features a wisteria-lined courtyard, artwork made by Low herself, period and original furnishings, and a gift shop. www.juliettegordonlowbirthplace.org. Photograph the fountain at Forsyth Park. It’s about a mile from the Savannah River down Bull Street to Forsyth Park. The 30-acre city park boasts expansive grassy fields, a children’s play area, tennis and basketball courts, and Savannah’s most iconic fountain, installed in 1858. Visit Saturday morning for the Forsyth Farmers’ Market, which features fresh herbs, flowers and vegetables as well as Georgia pecans, shrimp, artisan cheese, honey, pork sausage and chicken eggs. www.savannah.com/forsyth-park-3 and https://forsythfarmersmarket.com. Get to know Gracie. Those Spanish moss-covered oaks that look so enchanting by day are rather eerie at night. And that’s the best time to take a ghost tour. Savannah offers myriad ghost tours — I took the 90-minute Savannah Ghosts and Folklore Tour by Cobblestone Tours. During any of them, you’re bound to learn about Gracie Watson, who was born in 1883 and died at age 6 in 1889. Her parents managed the luxurious Pulaski Hotel, where Little Gracie would endear herself to the wealthy guests. After she died, they commissioned a life-size, picture-perfect sculpture of the girl. The monument adorns her gravesite at Bonaventure Cemetery. It’s free to walk around the 160 acres of hauntingly beautiful grounds, once part of a plantation. Guided tours are also available. Little Gracie’s grave is among the most visited, and guests often leave coins, barrettes and stuffed toys at the site. Poet and author Conrad Aiken is buried here. So is singer-songwriter Johnny Mercer and his great-grandfather Hugh Mercer, whose home is now the Mercer-Williams House Museum. www.ghostsavannah.com/haunted-history-tour and www.bonaventurehistorical.org. Wait in line at Leopold’s. Don’t be surprised to find a line out the door and down the street at this 100-year-old ice cream shop. But you really can’t leave town without a taste. Founded in 1919 by three brothers from Greece, Leopold’s is legendary for its premium ice cream in flavors such as lemon custard, honey almond and cream, and Savannah Socialite with Georgia pecans and bourbon-laced caramel. Pro tip: You can forgo the line at Leopold’s by getting ice cream at their outlet at the Savanah-Hilton Head International Airport. It won’t be the same experience, but it will be the same ice cream. www.leopoldsicecream.com. Take a to-go cup. Vegas, it ain’t. Savannah is much more charming. But this city’s open-container laws permit imbibers to carry open alcoholic beverages in plastic, 16-ounce cups — no bottles or cans — as long as they’re in the Historic District. A couple of the best places to put this practice to the test are Savannah’s artsy City Market and Congress Street, both lined with restaurants and bars. Congress Street Social Club is a happening night spot with live music and deejays. Sunday is an exception. Restaurants and bars aren’t permitted to sell alcohol until 12:30 p.m. Sunday. www.congressstreetsocialclub.com, www.savannah.com/go-congress-area and www.savannahcitymarket.com. Have barbecue in an old steamliner. Sandfly BBQ was my first stop as soon as I dropped by bags at my nearby AirBnB. Buy smoked meats by the pound or on a combination plate with two sides (mac and cheese, collard greens, slaw, smoked pork and beans, potato salad, green beans) plus Texas toast in a cozy and eclectic setting. Paper towels are on the table. So are three bottles of barbecue sauce: sweet, spicy and mustard-based. Try them all. www.sandflybbq.com. Ride a trolley. Give your feet a rest and explore the Historic District by trolley. A couple of different outfits do guided tours, including one that allows hop-on, hop-off privileges. Pro Tip: If you don’t mind skipping the narration and information, the city offers a free shuttle with two dozen stops in the Historic District. www.connectonthedot.com. Stay: Casa Amapola Victorian Condo on Forsyth Park features a king-sized bed, full kitchen, friendly hosts, and a prime location. www.airbnb.com. Drink in the treetops: Local 11’s rooftop bar lets you sip craft cocktails among live oak trees dripping with Spanish moss. www.local11ten.com/perch. Drink with the locals: At the bar at the American Legion Post 135, drinks are cheap. Bartenders are friendly. Atmosphere is casual, relaxed and unpretentious. (And Betty Bombers in back offers hand-helds and other American eats almost as long.) http://bettybombers.com and http://alpost135.com. Brunch it up: Servers at the Collins Quarter wear T-shirts that say, “Making brunch great again.” Brunch and dinner are great at this popular, well-appointed place with approachable prices and Instagram-worthy — from the Swine Time Bene (French toast, pulled pork, tomato, poached egg, bacon, Hollandaise) to the biscuits with bacon gravy and apple-raisin-chicken sausage or the avocado smash. Consider the spiced lavender mocha, iced mint julep espresso with basil-mint syrup or Drunken Berry Mimosa. www.thecollinsquarter.com. Get shrimp and grits: The host at my AirBnB said the shrimp and grits at the Public Kitchen and Bar are her favorite in town, so this is where I went. The rabbit linguini was good and hearty, too. www.thepublickitchen.com. Taste whiskey, etc. : Ghost Coast Distillery offers free tours every hour. Try the honey-flavored whiskey, the ginger-flavored whiskey, the straight bourbon, spiced rum, Jenny or Burl gins, and more. Tasting flights and craft cocktails are available. https://ghostcoastdistillery.com. Sip a local roast: Cup to Cup Coffee Roasters offers small-batch beans in a quaint setting near Savannah’s oldest cemetery. On a sultry Savannah day, cool off with an iced hop tonic: chilled espresso infused with Cascade hops and mixed with tonic. www.cuptocupcoffee.com. Grocery shop: Parker’s Urban Market, a corner shop located in an old gas station mart called “Fancy” Parkers by locals, is the Savannah version of Spokane’s Rocket Market. Think of it as the Rocket’s cool, younger, super-hip Southern cousin. Y’all can get gumbo here. Fried chicken, too. www.facebook.com/ParkersMarket. Shop shop: Head to River Street, Upper Factors Walk, City Market and Broughton Street for clothes, candy stores, tourist traps and more. Sample contemporary Southern cuisine: Treylor Park is a hip and modern eatery with shrimp and grits tacos, a grilled apple pie sandwich, chicken biscuit, fried banana pepper rings, banana pudding crème brulee, bourbon pecan pie, fried Oreos, a bacon brownie … are you booking a flight yet? http://treylorparksavannah.com. Published: April 7, 2019, 5 a.m.